The Dictionary feature helps you quickly spell a word or discover its definition from within Alfred's search box. Use the keyword "define" followed by the word you want to search for. If you misspell the word, Alfred will suggest the best dictionary guesses for it. Pressing the Return key will open the word in Dictionary.app to allow you to see the complete definition. Use the keyword "spell" followed by your best guess of the word you want to spell, and Alfred will suggest the correct spelling. Pressing the Return key will copy the correct spelling to your clipboard. 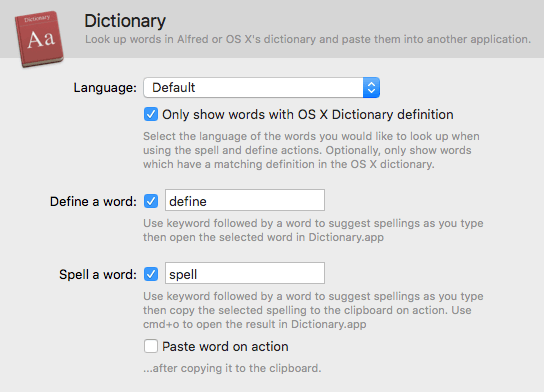 Alfred will use the default dictionary set by macOS, but this can be changed in Alfred's preferences under Features > Dictionary. You'll also be able to modify the "spell" and "define" keywords, and choose whether you want Alfred to paste the word when you press the Return key after using the "spell" keyword. Does Alfred offer a Thesaurus? The easiest way to reach the Thesaurus within Alfred is to use the keyword "define" followed by a word you'd like to look up. Pressing return on the result then takes you the Dictionary app where you can switch between Dictionary, Thesaurus, Apple and Wikipedia. Alfred remembers your last selection so you could even set it up to always open on the Thesaurus tab if you use it more often than the Dictionary tab itself.